6) Suggest concrete ways of improving policy effectiveness and making more rational policy choices. 4) it brings potential benefits to countries in environmental, social, economic, policy and institutional improvements. This section of the CITES website serves as an entry point for looking at effective CITES implementation from a ‘wider’ policy perspective. Focusing on the implementation and effectiveness of CITES-related policy is helpful for understanding the discrepancy between formal compliance (the ideal world of written law, action plans, scientific findings, trade moratoria, etc.) and real compliance (what is actually happening on the ground) with existing policy. Drafting policy declarations and laws that call for the conservation of wild animals and plants is easier than ensuring that those policies and laws are effectively implemented and achieve the Convention’s aims. 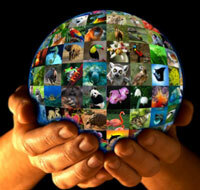 1) What are the main elements (the content) of the wildlife trade policy? 2) What resources are allocated for its implementation? 3) How are people involved? 4) How well is this wildlife trade policy working? The purpose of a policy review is essentially to answer these fundamental questions and to then pull all of the resulting pieces of information together. With this in mind, a ‘wildlife trade policy review’ involves several steps: a description of the policy-making context, a description of the policy’s content; a description of the policy’s operation; an overall analysis of the policy, including the identification of its biological and socio-economic impacts; and recommendations as well as plans for follow-up actions. The CITES mandate for undertaking work on wildlife trade policy reviews began in the year 2000, with the adoption of the Strategic Vision through 2005 (later extended through 2007). Objective 1.1 was to assist in the development of appropriate domestic legislation and policies that encouraged the adoption and implementation of social and economic incentives, allied to legal instruments that promoted and regulated sustainable management of wild fauna and flora as well as responsible trade, and promoted effective enforcement of the Convention. In 2001, with support from the European Union, a workshop was held for 11 mega-biodiversity exporting countries in which participants looked at legal and illegal trade in key exported species and how CITES contributed to national conservation objectives. The idea of wildlife trade policy reviews was ‘born’ thereafter from experience with the CITES National Legislation Project. At the 12th meeting of the Conference of the Parties to CITES (CoP12, Santiago, 2002), the Secretariat proposed the organization of a technical workshop on wildlife trade policies and economic incentives applicable to the management of and trade in CITES-listed species. This led to the adoption of Decision 12.22 directing the Secretariat, if external funds were found, to collaborate with CBD, FAO, FFI, ICTSD, IFC, IUCN, OECD, TRAFFIC, UNEP-ETB, UNCTAD-Biotrade, WRI and the World Bank in organizing the workshop. With support provided by Switzerland, a technical workshop on economic incentives and trade policy was held in December 2003. Participants included government representatives from six mega-biodiversity countries, representatives of intergovernmental organizations and non-governmental organizations, and academics with expertise in policy and economics. The results of the workshop (plus a background paper on methodologies for national trade policy reviews and a scoping paper on individual transferable quotas for Acipensiformes species in the Caspian Sea) were presented at CoP13 (Bangkok, 2004). The Secretariat asked for an extension of its mandate in order to complete other envisaged activities. This led to the adoption of Decisions 13.74 to 13.77 on wildlife trade policies and economic incentives. 2) compile and synthesize the information in a report analysing the impacts of national policies on trade in CITES-listed species in terms of socio-economic and conservation benefits and costs. Financial support for a joint project on enhancing national capacities to review wildlife trade policies in support of CITES (the CITES Policy Review Project) was ultimately provided by the CBTF (with funds provided by the European Union) and the Geneva International Academic Network. Work under the CITES Policy Review Project began in 2006 with the establishment of an international steering committee and advisory group, identification of four pilot countries (Madagascar, Nicaragua, Uganda and Viet Nam), development of a draft framework for reviewing wildlife trade policies and planning of social science studies that would be done in parallel with the reviews. By early 2007, national steering committees and review teams for all four pilot countries had been established. A Geneva-based meeting of the pilot country teams and national consultative workshops were then held to launch and prepare for undertaking the reviews. Desk and field studies were conducted at country level and draft review reports were developed. A working document on the project’s achievements and the overall value of wildlife trade policy reviews was prepared by the Secretariat and submitted for consideration at CoP14 (The Hague, 2007). Representatives of the pilot countries took the floor during relevant committee discussions to support continued work on wildlife trade policy reviews. They also described their experiences with the policy review during a side event. The Conference of the Parties ultimately adopted Decisions 14.21 – 14.24 which, inter alia, invited exporting and importing countries to carry out policy reviews and to share relevant details of the reviews and lessons learned. In addition, Objective 1.1 of the new CITES Strategic Vision: 2008-2013, adopted at CoP14, calls for Parties to comply with their obligations under the Convention through appropriate policies, legislation and procedures. In 2008, a Geneva-based meeting of pilot country teams and more national consultative workshops were held to conclude the review project, finalize the review reports, provide feedback on the draft review framework that they had tested and reach agreement on an outline for the report synthesizing all four national reviews. While in Geneva, pilot country teams also participated in a side event held on the margins of the CITES Animals Committee meeting, where they provided a brief summary of their review findings and conclusions. Additional outputs from the CITES Policy Review Project will be provided in the future and there are plans to establish an open-ended wildlife trade policy forum on the CITES website. National and regional follow-up actions are currently underway.